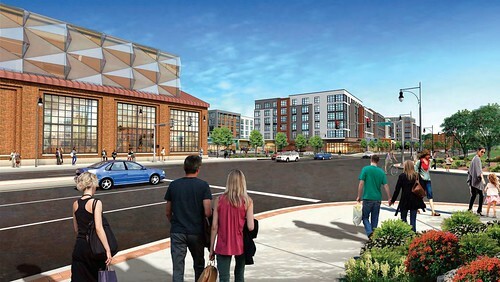 Architects Prellwitz Chilinski Associates, Inc.
Approved multi-phased redevelopment and expansion of the former Arsenal Mall in Watertown’s East End. Arsenal Yards will feature 350,000 square feet of retail and entertainment, approximately 425 residences ranging from studios to three-bedrooms, a 145-room Hampton Inn and Suites by Hilton hotel and 100,000 square feet of office space. Retail at Arsenal Yards will include a 30,000 square foot specialty grocer, a cinema with 6-8 limited-seating screens, active entertainment, a combination of boutiques and national retailers, half a dozen chef-driven restaurants and a premium wine superstore. Two existing historic buildings at Arsenal Yards will be restored and repositioned with creative architectural additions. Five new buildings will be constructed on existing surface parking lots ranging from 3 to 12 stories and 40 to 129 feet tall, including a 12-story, 129 foot tall residential tower. Over 20,000 square feet of the project site area will be reserved for green and open public space including Arsenal Park, a new park located between Arsenal Yards and the Charles River. Arsenal Yards will feature Zipcar stations, electric vehicle chargers, and the latest smart parking technology. Construction of Arsenal Yards is expected to commence in late 2017, with the development's first phase opening in Spring 2019. Developers Boylston Properties and The Wilder Companies have proposed a change of site G within the Arsenal Yards project from a residential building to life sciences. The updated proposal calls for an 8 or 9 story building to include around 155,000 square feet of office/lab space and a parking garage. A path would link to the Charles River with a community park next to the building. The development team hopes to begin construction in spring 2020 with completion in 2022. Cell therapy company SQZ Biotech has signed a 63,477 square foot lease at Arsenal Yards. Boston-based real estate developer Boylston Properties has announced that cell therapy company SQZ Biotech has signed a 63,477 square foot lease at Arsenal Yards. With 200,000 square feet of lab and office space, Arsenal Yards is meeting the demand from the life science community for lab space in the East End of Watertown. “This continues a trend of life science companies choosing to grow in Watertown's booming biotech scene,” said Duncan Gratton, Executive Director at Cushman & Wakefield. “This is our 6th new life science space lease in Watertown in the past 18 months.” Gratton and Elizabeth Donatoni of Cushman & Wakefield represented ownership, a joint venture of Boylston Properties, J.P. Morgan and Wilder, while SQZ Biotech was represented by Juliette Reiter and Mark Winters of Newmark Knight Frank. Located on the Charles River in the dynamic East End neighborhood of Watertown, Arsenal Yards will be a thriving urban village with over 50 retailers & restaurants including Roche Bos. and the seven-screen Majestic Theater, over 300 contemporary residences, a 150-room Hampton Inn & Suites by Hilton, as well as office and life sciences space. The development will also include considerable open spaces throughout, access to a revitalized Arsenal Park, as well as connection to the Watertown-Cambridge multi-use bike path. Arsenal Yards is being developed by Boylston Properties, Wilder, and J.P. Morgan. Foundation work is ongoing for Building B at the Arsenal Yards project. This part of the project is set to include a parking garage and 150 room Hampton Inn. Across the parking lot, renovations are continuing in Building F future home of the Majestic Cinemas. When complete in 2020 Arsenal Yards will feature 425 residential units along with 450K sf of office and retail space. Boylston Properties and The Wilder Companies proudly announced today that Shake Shack will join Arsenal Yards, which by 2020 will be a thriving new neighborhood comprised of over more than one million square feet of development including 250,000 sq. ft. of curated shops and eclectic eateries, 200,000 sq. ft. of new and existing creative office and life science space, 425 contemporary residences, and a 150-room Hampton Inn & Suites by Hilton. The development will also include dedicated green space, access to a revitalized Arsenal Park, connection to the Watertown-Cambridge multi-use pathway and an accessible pedestrian/bicycle path to the Charles River. Known as a cult-favorite around the world, Shake Shack is a critically acclaimed, a modern-day burger stand praised for its delicious food, including premium burgers, chicken sandwiches, flat-top dogs, frozen custard shakes and crinkle cut fries. As part of Shake Shack’s mission to Stand For Something Good®, they source only the highest quality ingredients from the best ranchers, farmers, bakers, and food purveyors. Their beef is 100% all-natural Angus, never frozen, vegetarian fed, humanely raised and source verified. Their chicken is 100% all-natural and their flat-top hot dogs are 100% all-natural Vienna beef. All with no hormones or antibiotics, ever. "We're excited to add another dynamic gathering place to Arsenal Yards," said Tom Wilder, principal of The Wilder Companies. "Shake Shack’s investment in everything they do from sourcing high-quality ingredients, often from local artisan purveyors, to the investments they make in developing deep ties to their communities is truly unique and we're excited to have them be a part of the Arsenal Yards' experience." The Shake Shack at Arsenal Yards menu will feature all the Shack classics, including the ShackBurger®, crinkle-cut fries, and hand-spun shakes, plus a selection of frozen custard concretes in collaboration with local food purveyors. Shake Shack will donate a portion of the proceeds from one of the concretes to a local Watertown charity partner. In keeping with Shake Shack’s commitment to green architecture and eco-friendly construction, the restaurant will be constructed with recycled and sustainable materials. Booths will be made from lumber certified by the Forest Stewardship Council, and tabletops will be made from reclaimed bowling alley lanes. "We’re thrilled to bring Shake Shack to Arsenal Yards," said Andrew McCaughan, Vice President of Development at Shake Shack. "East End Watertown is a unique, culturally rich community that holds tremendous potential for continued growth. We couldn't be more excited to move into the neighborhood." Various stages of construction are ongoing at Arsenal Yards in Watertown. The project that is being completed in phases through 2020 will include 250,000sf of retail, 200,000sf of office, a 150 room hotel, and 425 residential units. The two historic buildings on the site that will remain have been gutted for renovation. A goal of the project is to maintain their character as a call back to the site's history as the home of the U.S. Army's Watertown Arsenal. When completed these two buildings will hold a Majestic Cinema and various shopping and dining options. Construction crews are also pouring the foundation for Building B which will house the Hampton Inn and the parking garage for the development. The project is also set to include an outdoor plaza and a park connected to the Charles River. The Arsenal Yards development in Watertown has received an addition $102 million in financing .totalling $324 million for the project. HFF worked on behalf of Boylston Properties, The Wilder Companies, and Jonathan Bush to source institutional investors advised by JP Morgan Asset Management as joint venture equity partners, providing $102 million of equity. This comes after the project had received a $222 million loan from Wells Fargo Bank in the beginning of June (2018). The property is a multi-phased redevelopment and expansion of the former Arsenal Mall in Watertown’s East End. Arsenal Yards will feature 350,000 square feet of retail and entertainment, approximately 425 residences ranging from studios to three-bedrooms, a 145-room Hampton Inn and Suites by Hilton hotel and 100,000 square feet of office space. Retail at Arsenal Yards will include a 30,000 square foot specialty grocer, a cinema with 6-8 limited-seating screens, active entertainment, a combination of boutiques and national retailers, half a dozen chef-driven restaurants and a premium wine superstore. The Arsenal Yards development project has been mortgaged for $222 million via Wells Fargo Bank. Arsenal Yards, Boston’s new mixed-use destination development from Boylston Properties and The Wilder Companies, announced today that Roche Bros., the locally owned and family-operated grocer, has signed on to open a large-scale, full-service supermarket offering high-quality meat, seafood and produce, ready-to-eat prepared foods, national grocery favorites, catering, and home delivery. The Majestic at Arsenal Yards, a state-of-the-art movie theater, is joining as a premier entertainment destination. City Works Eatery & Pour House, recognized for its classic American cuisine with a modern twist and outstanding selection of 90+ local and global beers will be opening its first New England location at Arsenal Yards. Phase 4 of the Arsenal Yards master plans to be presented and discussed at a community meeting on Thursday, April 12th. The final layout and design of buildings C, D and E.2 will be explained as well as discussing the operation of the property during construction. These three buildings will contain retail, residential apartments and dedicated residential parking. The discussion will also include the massing of the buildings. In two recent community meetings, Boylston Properties and Wilder Properties outlined plans for the proposed redevelopment of the existing Arsenal Mall located along the Charles River in Watertown. A formal project application to the City of Watertown's Planning Board is expected this month. Boylston Properties and Wilder Properties acquired the Arsenal Mall in August 2013 for $70.5 million. 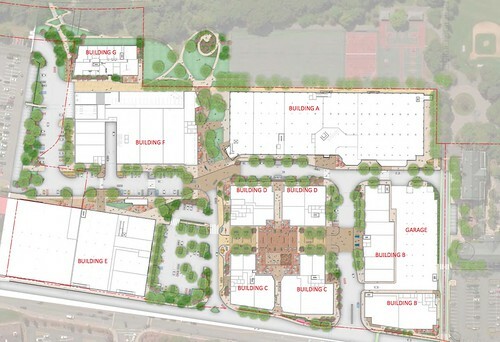 Plans call for the repositioning of the two existing mall buildings and construction of five additional buildings on the mall's surface parking lot, creating a total of approximately 500 residential units and approximately 350,000 square feet of retail. Additional information about the proposed project, including architectural renderings, can be found above. The following are links to the Project Narrative, Community Outreach Meeting #4 presentation and Community Outreach Meeting #5 presentation for The Arsenal Project. Thursday, Jan. 12, 2017 - WATERTOWN, MA – The Watertown Planning Board yesterday gave a 5-0 vote of approval to Arsenal Yards, a vibrant new development with a mix of uses at the former Arsenal Mall in Watertown being planned by Boylston Properties and The Wilder Companies. Arsenal Yards, a name recalling the proud part this East End of Watertown played as commercial hub over almost two centuries, is a redevelopment and expansion of the former Arsenal Mall, more recently known as The Arsenal Project. The mixed-use development will feature 350,000 square feet of retail and entertainment, about 500 residences, and 100,000 square feet of existing office space. After 90 minutes of discussion and comment by Planning Board members, Watertown Planning staff, Town Council members, and many neighbors and residents of the area, the Board approved a Special Permit for the Arsenal Yards master plan. Boylston Properties and The Wilder Companies plan to begin construction in six to eight months. Discussion at the last night’s meeting focused on the considerable tax benefits, shopping and entertainment opportunities, and additional housing that Arsenal Yards will bring to the town. 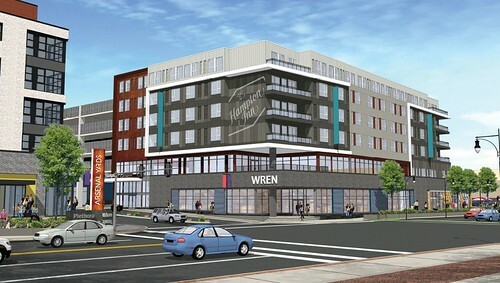 Arsenal Yards will feature eclectic and authentic retail, locally curated shopping and dining opportunities, comfortable open spaces, a specialty grocer, a cinema and entertainment lounge, and many other attractive amenities, designed as a neighborhood hub with residents of Watertown and neighboring communities in mind. Arsenal Yards, established in 1816 by the U.S. Army as an ordnance depot and small arms factory, served multiple defense functions over the years and ceased operations in 1968. The complex underwent conversion into a covered shopping mall with acres of open parking in the early 1980s. Handsome historic portions of the original manufacturing complex will be retained, with creative architectural additions, respectful restoration, and sustainability as priorities. The architect for Arsenal Yards is Prellwitz Chilinski Associates, Inc. of Cambridge. It will be welcoming and highly accessible for bicyclists and pedestrians but have sheltered parking for those who drive or live there. The creators and developers of Arsenal Yards are investing millions of dollars in infrastructure improvements to transform the extensive paved surfaces and aging intersections. The improvements will include the city’s own Arsenal Park, an adjacent space with greater potential for public enjoyment located between the development and the Charles River. A town-led group will be formed soon to work with the development team to create a reimagined Arsenal Park that will suit the town and all its intended users. With housing in the region, including Watertown, in short supply, Arsenal Yards will create 428 new market-rate residences and 75 affordable apartments. A destination, not a mall, and unlike any other retail destination in the region, it will have half a dozen chef-driven restaurants, a specialty grocery, a premium wine “superstore,” a cinema with 6-8 limited-seating screens, active entertainment, and a combination of boutiques and national retailers. Arsenal Yards will feature Zipcar, EV chargers, and the latest in “smart parking” technology. The completed project, over phases, will contribute significantly to Watertown’s tax base, approximately doubling the tax revenue from the current amount paid to the town. For more information, please go to www.arsenalyards.com or http://courb.co/arsenal . Boylston Properties is a 34-year-old Boston-based developer of urban mixed-use projects including retail, residential, hotel, office, and research buildings. The company draws upon urban and suburban development experience on its own or with partners in the Northeast U.S. markets, many in the Greater Boston area. Boylston Properties has recently opened the 150-room Marriott Residence Inn Boston Watertown and is developing LINX, 185,000 square feet of office space, both near Arsenal Yards. For more information, please go to www.boylstonproperties.com. The Wilder Companies is a Boston-based real estate development, management, and leasing firm specializing in the positioning of retail properties. Privately held and owner managed, Wilder’s mission has been and continues to be to create vibrant shopping places that meet and exceed the expectations of customers, retailers, and investors. From lifestyle centers, urban properties, and community centers to mixed-use developments and super-regional malls, The Wilder Companies has developed, managed, and leased more than 20 million square feet of retail properties throughout the United States and Puerto Rico. The company continues to have a diverse portfolio of properties throughout the East Coast. For more information, please go to www.wilderco.com .